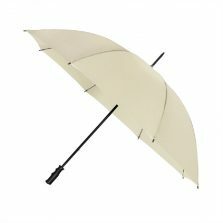 This large white windproof umbrella boasts a super-sized, manual opening, ten panel canopy 130 cm across. 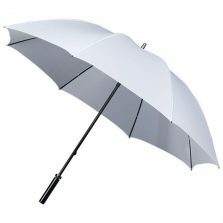 Scroll down and read more about this wonderful white umbrella! 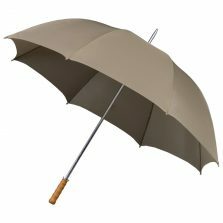 Looking for a white windproof umbrella? 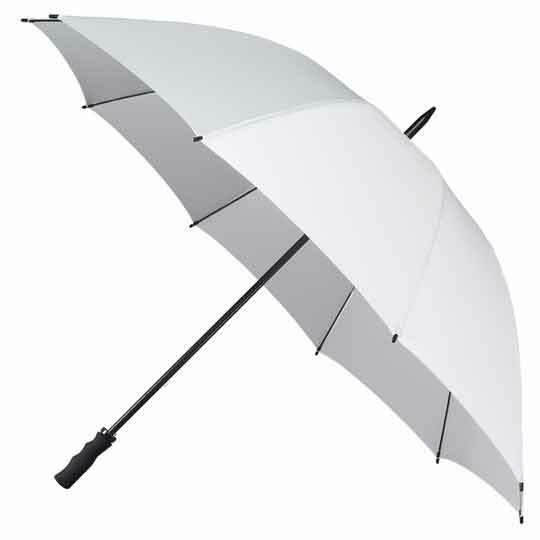 This StormStar large white windproof golfing umbrella could well be the ideal umbrella for you. The StormStar is a great new addition to our range of quality windproof golf umbrellas. Featuring a sturdy black fibreglass shaft, frame & ribs, finished off with a stylish rubber coated pistol grip handle. The length from handle to tip is 100 cm. A sliding metal tip cup keeps the spoke tips, and these umbrellas, neat and tidy when they’re closed. 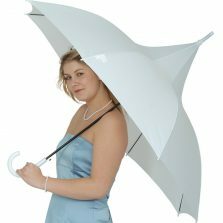 A great umbrella for sporting, social and family occasions, a wedding or anything really. Except perhaps Glastonbury, a swimming lesson or potholing weekend, where a white golfing umbrella might not be quite so practical. Is this white windproof umbrella not the one for you? Click to check out the rest of our range of quality Windproof Golf Umbrellas!